Robert Zemsky has spent his career at the University of Pennsylvania focusing on how best to keep universities true to their missions while at the same time remaining market smart. He currently serves as chair of The Learning Alliance, a broad coalition of experts assisting institutions of higher learning in striking the balance between market success and public mission. He also is currently a Senior Scholar for the Alliance for Higher Education and Democracy (Penn AHEAD) at Penn GSE. At Penn, Prof. Zemsky has been the university's chief planning officer, and served as master of Hill College House. For 20 years, he served as the founding director of the university's Institute for Research on Higher Education, one of the country's major public policy centers specializing in educational research and analysis. In his research, Prof. Zemsky pioneered the use of market analyses for higher education. Something of a contrarian, Prof. Zemsky recently described himself in the Chronicle of Higher Education as being "old and round enough to be mistaken for a pooh-bah." He was a member of the Secretary of Education's National Commission on the Future of Higher Education. He has forcefully argued that colleges and universities need to be transformed from within. He has focused on what globalism might really mean for higher education, on what technology has not accomplished, and on how to make learning important in the higher education marketplace. Prof. Zemsky has served as co-director of the National Center on the Educational Quality of the Workforce, as a senior scholar with the National Center for Postsecondary Improvement, as chair and convener of the Pew Higher Education Roundtable, and as senior editor for Policy Perspectives, a publication of the Pew Higher Education Research Program. He served as a founding member of the National Advisory Board for the National Survey of Student Engagement (NSSE). In 2008 he retired from the Board of Trustees of Franklin and Marshall College after 25 years of service. That same year he was elected to the Board of Whittier College, his alma mater. Prof. Zemsky is the author of The Structure of College Choice (1982), Structure and Coherence, Measuring the Undergraduate Curriculum (1989), Higher Education as Competitive Enterprise: When Markets Matter (2001), Thwarted Innovation: What Happened to e-learning and Why with William Massy (2004), and Remaking the American University: Market Smart and Mission Centered with Gregory Wegner and William Massy (2005). His most recent book, Making Reform Work: The Case for Transforming American Higher Education (2009) has sparked a major discussion of the need for curricular re-engineering across American higher education. Prof. Zemsky's international experience includes serving as a founding trustee of the International Centre for the Study of East Asian Development in Kitakyushu, Japan; as convener and chair of the Transatlantic Dialogue of educational leaders from Europe and the United States, sponsored by The Pew Charitable Trusts in cooperation with the American Council on Education and the Conference of European Rectors; as a senior consultant to the President and Parliament of Hungary; as a project consultant to the Ministries of Education in the Republic of Zimbabwe and the Republic of Egypt; and as a principal leader of United States-sponsored seminars in Tunisia and India. Prof. Zemsky played a major role in the Six-Nation Project on Global Education for the 21st Century sponsored by the University of Pennsylvania. This effort knit together working scholars and policy makers from China, Germany, Japan, Singapore, Switzerland, and the United States in a set of comparative studies that focus on topics important to the formation of national goals and policies for primary, secondary, and postsecondary education. He has served as a senior advisor to the University of Kobe, Japan and, in June 2003, joined the Glion Symposium. From June 2003 through July 2004 he served as a principal consultant to the Singapore Management University and in 2005 as a principal consultant to the National University of Singapore. In 2005 he also served as a Fulbright Senior Specialist in Vietnam. From August 2006 through May 2009, he served an auditor for the Australian Universities Quality Agency (AUQA). In 2009 Professor Zemsky served as senior consultant to the Higher Education Review Unit—Quality Assurance Agency for Education and Training, Kingdom of Bahrain and Senior Researcher for the Ministry of Presidential Affairs’ (MoPA) evaluation of the UAE's Education System's Outcomes and their Alignment with Labour Market Requirements. Named in 1998 by Change magazine as one of higher education's top 40 leaders for his role as an agenda-setter, Prof. Zemsky is a former Woodrow Wilson Fellow and was a postdoctoral Social Science Research Council Fellow in Linguistics and later chair of that council's Committee on Social Science Personnel. In 1998 he received a Doctor of Humane Letters (Hon.) from Towson University and in 2008 a Doctor of Humane Letters (Hon.) from Franklin and Marshall College. He holds a B.A. from Whittier College, and an M.A. and Ph.D. from Yale University. Ph.D. (History) Yale University, 1966. Read about Remaking the American University. Zemsky, R.: Making Reform Work. Piscataway, NJ: Rutgers University Press, 2009. Zemsky, R.: The Rain Man cometh - again. Academy of Management Perspective 22(1), 2008. Zemsky, R.: Has our reach exceeded our grasp? Taking a second look at higher education as a global enterprise. The Globalization of Higher Education. L. E. Weber & J. J. Dunderstadt (eds.). London: Economica, Ltd. 2008. 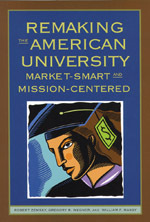 Zemsky, R., Wegner, G. R., & Massy, W. P.: Remaking the American University: Market-smart and Mission-centered Piscataway, NJ: Rutgers University Press, 2005. Zemsky, R., & Massy, W.: Thwarted Innovation: What Happened to e-learning and Why The Learning Alliance 2004. Zemsky, R., Shaman, S., & Shapiro, D.: Higher Education as Competitive Enterprise: When Markets Matter. San Francisco: Jossey-Bass, 2002. Zemsky, R., Shapiro, D., Iannozzi, M., Cappelli, P., & Bailey, T.: The Transition from Initial Education to Working Life in the United States of America. NCPI Project Paper #1 1998. Zemsky, R.: Structure and Coherence. Association of American Colleges and Universities, 1989. Zemsky, R., Johnston, J., & Shaman, S.: Unfinished Design. Association of American Colleges and Universities, 1988. Zemsky, R., & Meyerson, M.: Training Practices: Education and Training Within the American Firm. Report to the National Institute of Education, 1985.